Happy Thursday Fabulous Friends!! If you stopped by on Tuesday then you know that today I am sharing the reveal of the best thrift store find I’ve had in a long time. 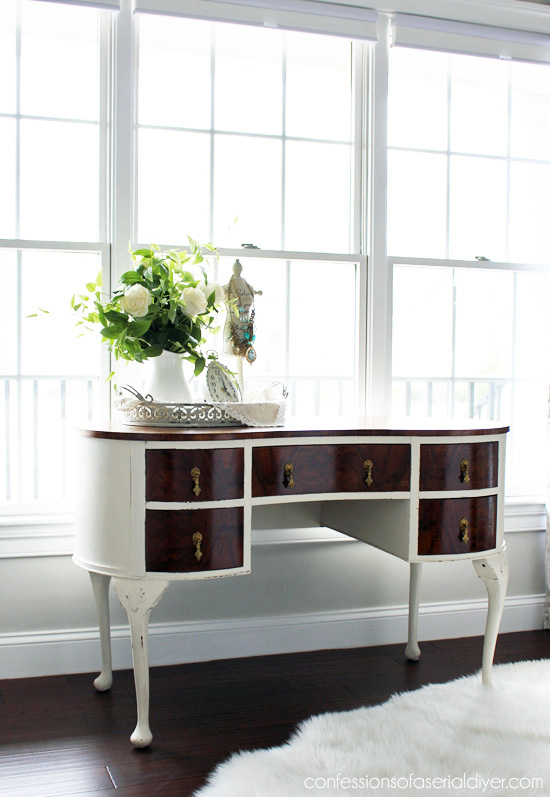 I scored this gorgeous dressing table for a mere $30!! That Goodwill never has good furniture but when I saw this, I couldn’t pay for it fast enough. 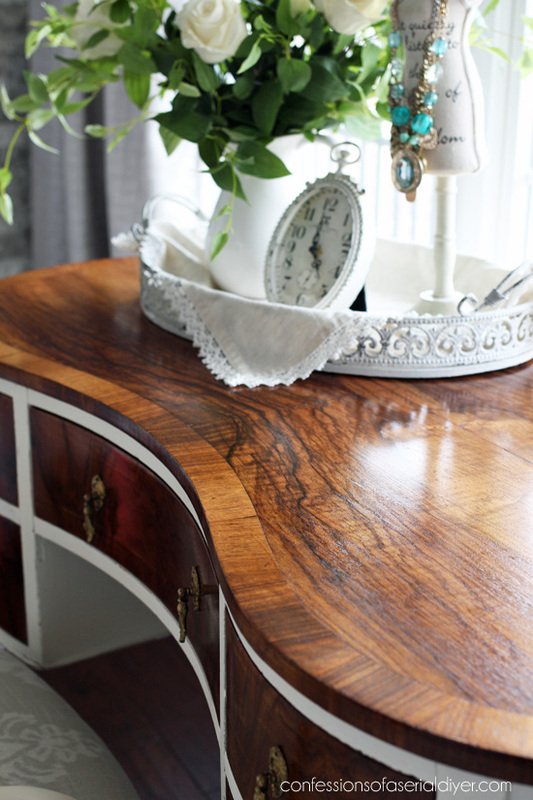 It could also be a writing desk, but the pretty curves make it a perfect place to sit and pretty yourself up in the morning! It is very unique and beautiful, and I know everyone is probably hoping I didn’t take a paintbrush to it, however it was not without its woes. I was unsure how to go about fixing the top. 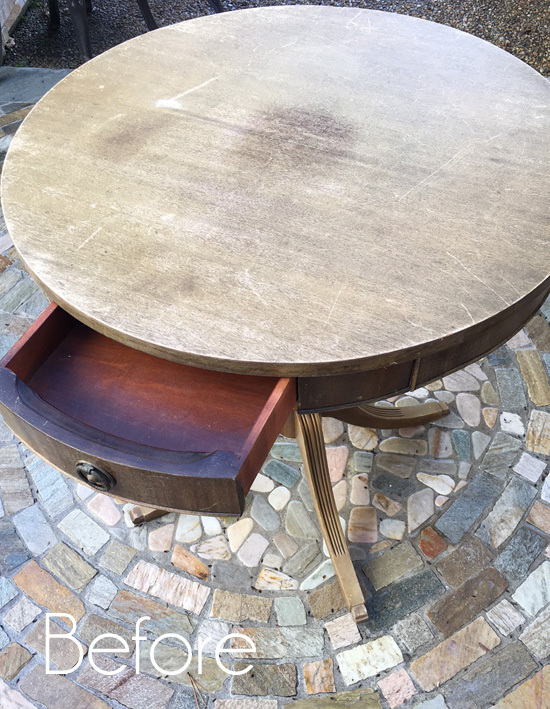 Do I remove the veneer and paint what’s underneath? Do I try to salvage the veneer? 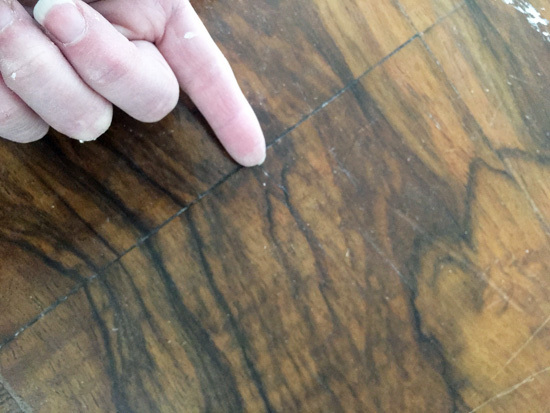 Is it thick enough to take a good sanding? I’ve included a few affiliate links so you can find the products I use. Luckily I was able to squeeze some wood glue in there and fix that spot. Then I sanded the surface with my orbital sander hoping I wouldn’t mess it up by going too deep. I did take it down a bit too far on one side, but overall I was pleasantly surprised how well it did, and it smoothed the two seams right out! Okay so I just could not cover up all of that beautiful wood even if it was veneer! 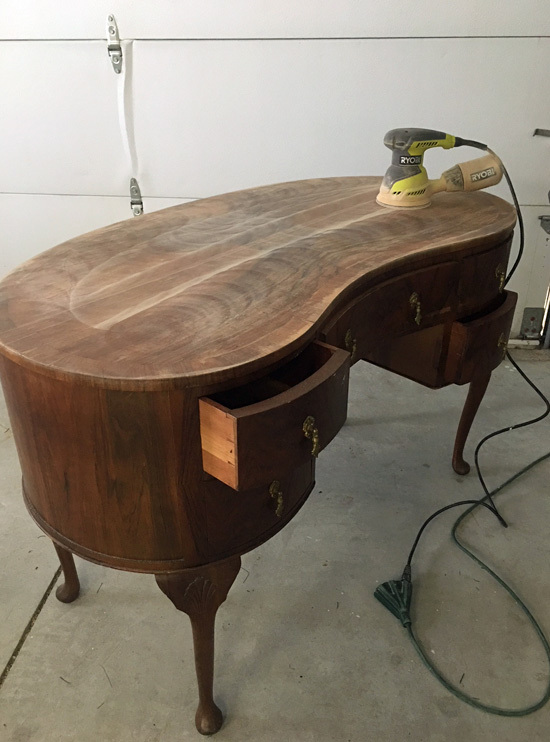 The drawers and top looked as though they had about 50 years of wax build-up on them, so I was so pleased that I was able to fix that and make them beautiful again. The before felt very top-heavy to me, so I chose to paint the body to lighten it up. I thought a more creamy color rather than a stark white was more appropriate for this piece. I sealed the painted areas with Annie Sloan’s clear soft wax. 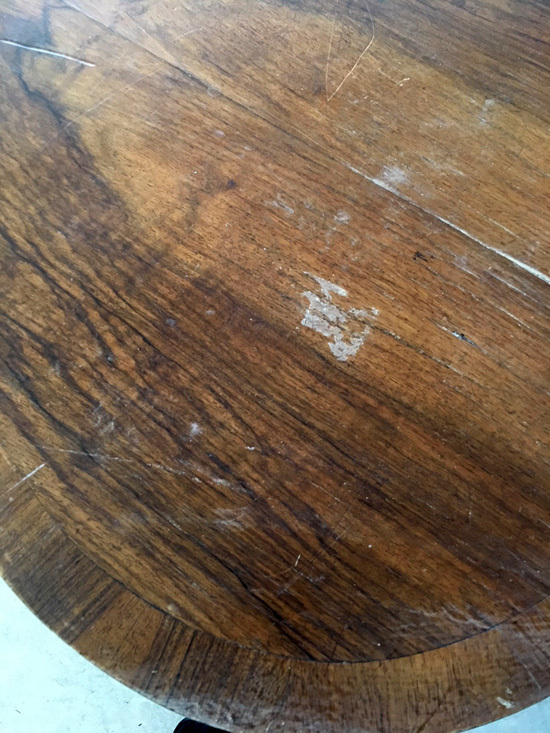 To finish the top surface and the drawers after sanding them, I used Minwax Wood Conditioner, applied with a soft cloth to prep the surfaces for stain. 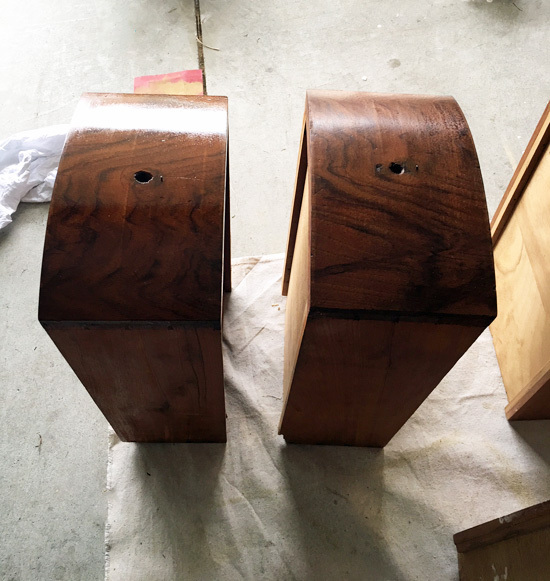 Then I gave them two coats of Minwax stain in Dark Walnut, sanding lightly between coats. At first I sealed with Minwax Wipe-On Poly in satin which is what I normally use on wood surfaces to seal. However, after two coats the top looked blotchy…a combination of dull with weird shiny areas…see the weird shiny spots? That must be where I didn’t sand quite enough. You can also see where I sanded a bit too far on that front corner. To remedy the horrible mix of shiny and dull on the top, I decided to use Zinsser Clear Shellac that I normally use to seal in pieces to prevent bleed-through. I always forget that I can seal pieces with that as well! Here is the difference on two of the drawers. The left is with the shellac, and it has a bit more shine but looks so much better! There are still a few deep scratches in the veneer and the drawer fronts aren’t quite perfect, but they tell the story of this piece. What about those pretty pulls? I love when I don’t have to buy new hardware! The one on the right is all shiny and new now. These look like beautiful jewelry! I sealed the drawers with a this matte spray sealer. Well I hope ya’ll are okay with me painting some of this pretty piece. I tried my best to preserve the pretty wood parts. 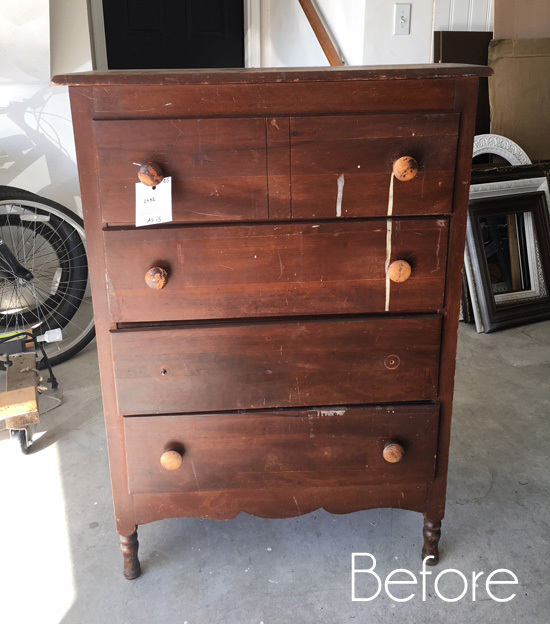 See how I saved this forgotten treasure HERE! OMG What a beautiful piece of furniture and was a steal for that price. Love the whole new make-over including the hardware. Christy, I love the jewelry on, and strips in, the drawers. It’s a beautiful piece though I admit I am not sure how I feel about the white. It certainly makes the wood stand out beautifully. Have a great rest of your week and an outstanding weekend! Wow!! I love it. I think this is my favorite so far. You are amazing. Love your transformations & your photography. Thank you for sharing with us. That is simply gorgeous!!! Well done! Did you decide to keep this beauty or sell it? That is beautiful!!!! Is this for sale ? Yes it is, Carol! It will be heading to my booth this weekend! Wow. I don’t usually comment, but that table turned out beautifully! I wish I had a sander like that. I would do a lot more projects! I didn’t see that coming! I was expecting it to all be white. Great job! 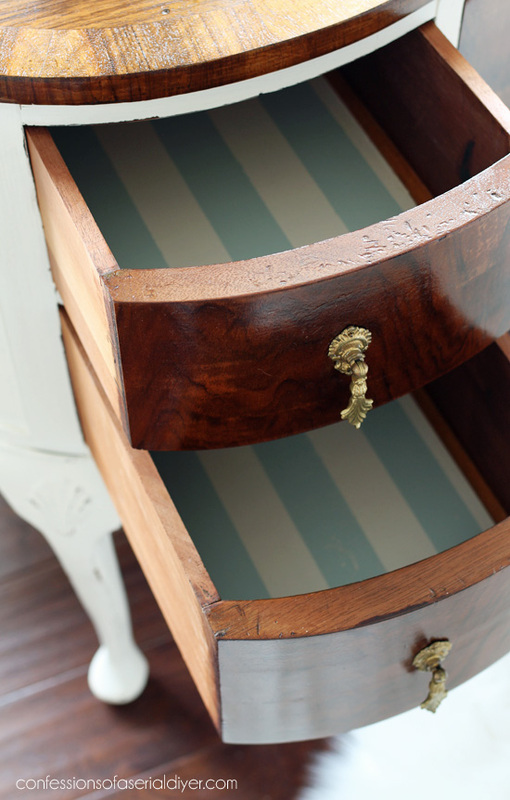 I also love the stripes inside the drawers. She sure is a beauty now! 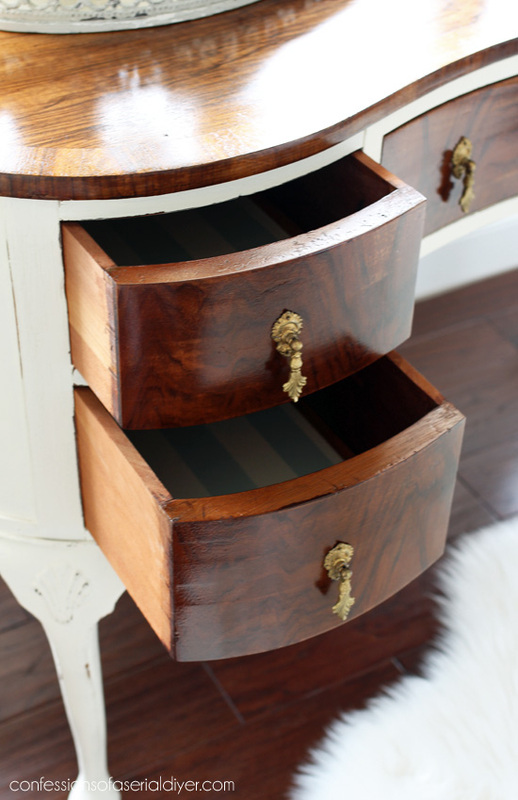 The drawer pulls are like jewelry and the stripes in the drawers are beautiful finishing touches. She appeared to be well loved and I wonder who owned her. I wonder what sort of mirror was used. A mirror on an easel…hand mirror only…? 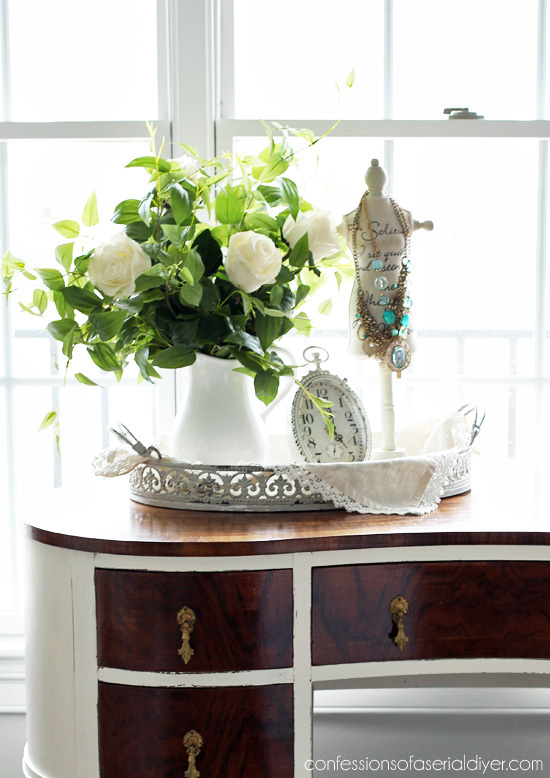 The dressing table may have been a part of a bedroom suite or maybe a gift from a doting husband. It could function as a desk as well. You hit the jackpot on this one! What a lucky find! I love seeing all the worn wood on the drawer edges. Did you disassemble the drawers to paint them or were they coming apart already? 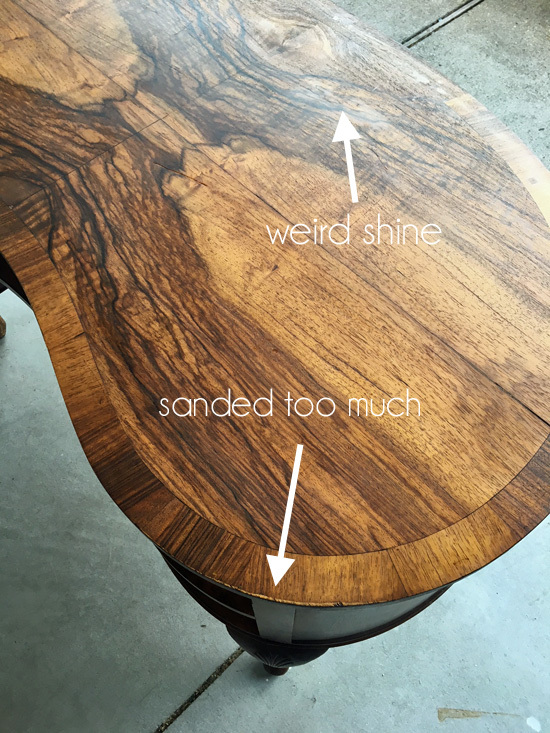 You could clean all the built up wax off with lacquer thinner or denatured alcohol before & after sanding to avoid the blotchy look after applying a wipe on finish, which happens when there is still wax left in the wood or veneer. 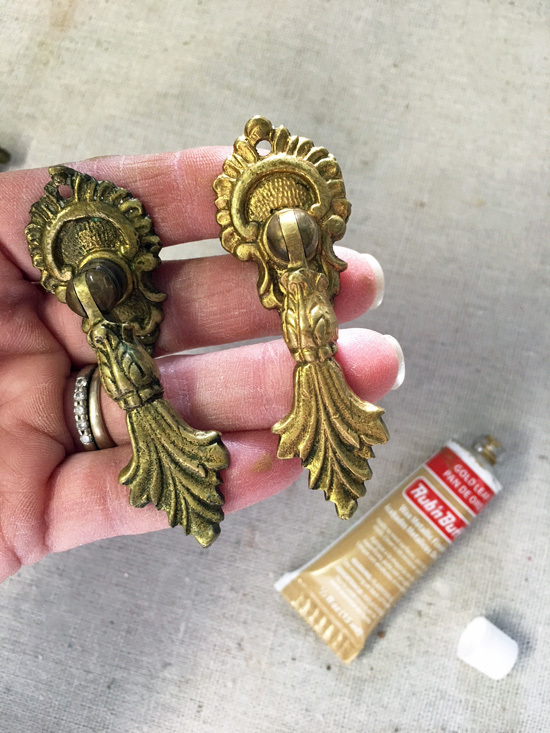 I have been refinishing furniture for 30 years as a hobby & I have had lots of similar situations but conquered most of them as the years went on & learning from others. I also never stain the veneer I use a wipe on tung oil & the natural color always come up beautiful. Hope this helps some. Love it, great job, Christy! Oh my gosh! 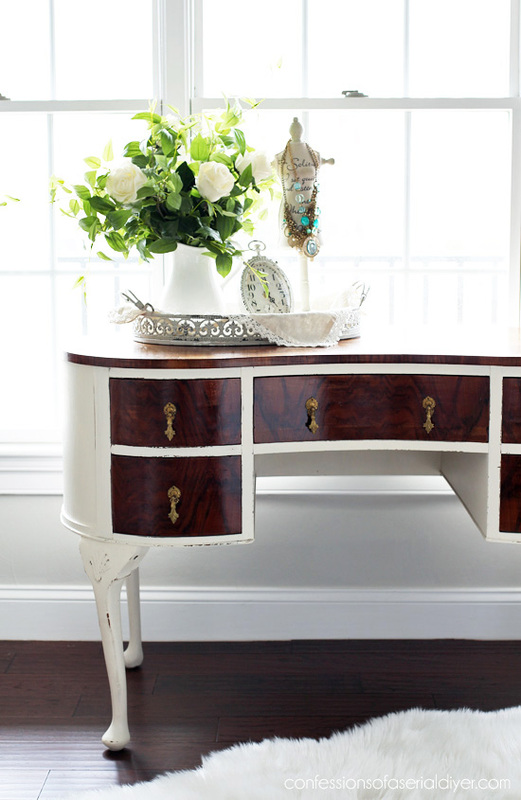 The desk is so incredibly beautiful! You have a great “eye” and amazing skills. Stunning makeover! Love love love it!! You are so talented. Can’t wait for the next makeover. I love it 😍 great job!! 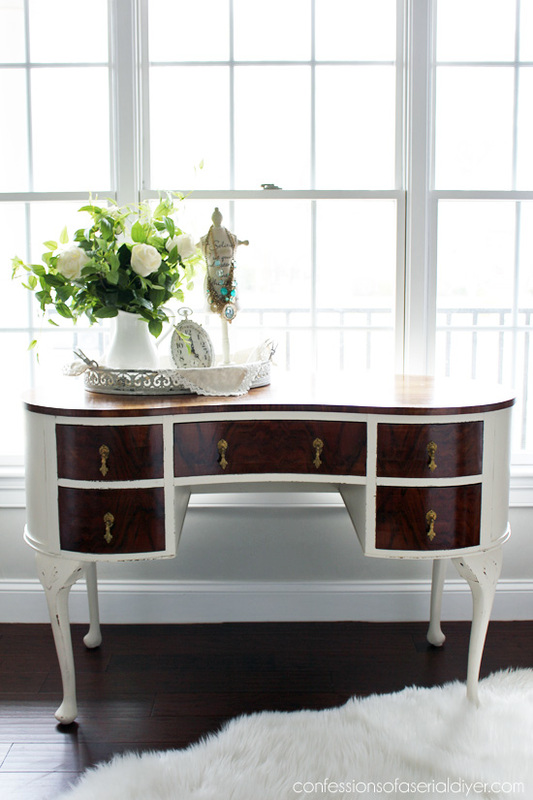 You always find the most beautiful pieces of furniture! I love that table and want it! Thank you for sharing. You have such a great eye for detail. That turned out beautifully! I rarely take the time to do anything with the inside of drawers, but this one is making me re-think that. I really love those blue stripes! That turned out beautiful! One of my favorites so far! You have such an eye for bringing new life to pieces that are dated or neglected. The price on that was amazing too-pieces like that would be sold for three or more times that amount in my neck of the woods. Have a wonderful day! First of all Christy, I’m still salivating over the $30 – talk about a sweet score! 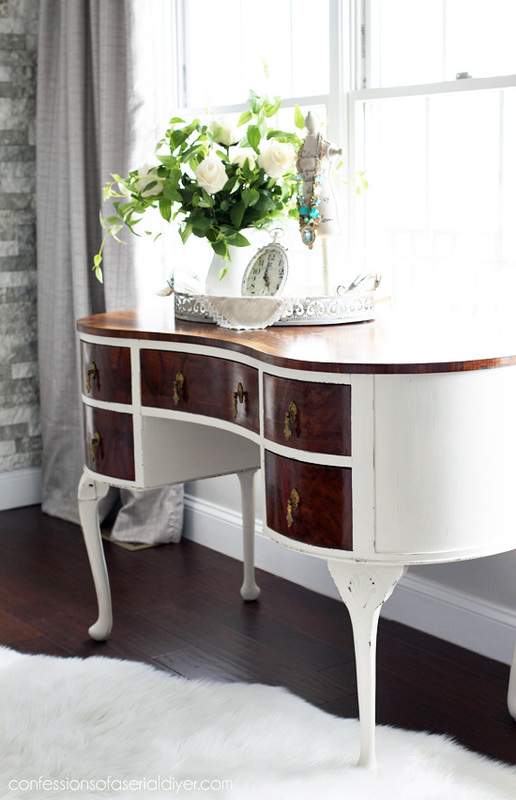 What you did with this dressing table is absolutely stunning! If you lived near me, I’d be at your door this very minute with cash in hand because my office needs this to use as a desk. Christy that is just gorgeous. I am so glad you were able to fix the top and make those waves of wood shine. 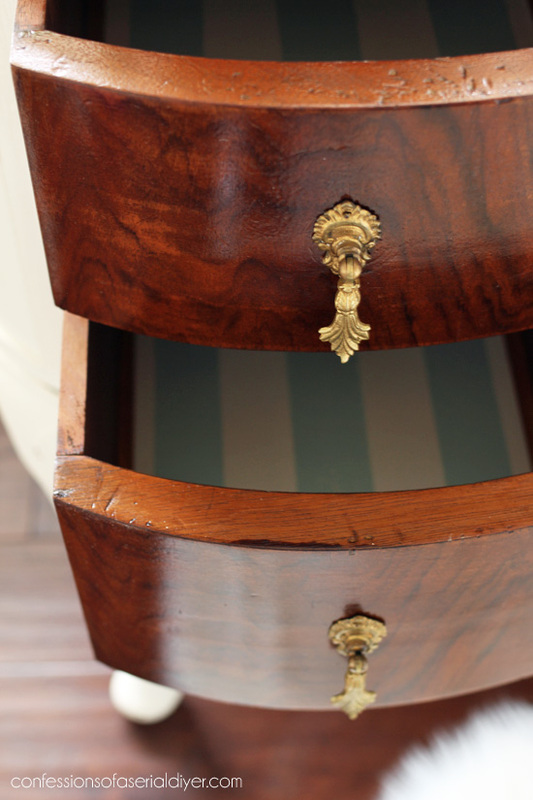 And the drawers also look beautiful now that they have been refinished. A truly one of a kind piece. Hey Christy, Hope you don’t mind me saying my ideas for this piece. All in all a great job. Hi Christy wow just unique and gorgeous! I like to follow your product links since I’m not yet a pro at this like you are. 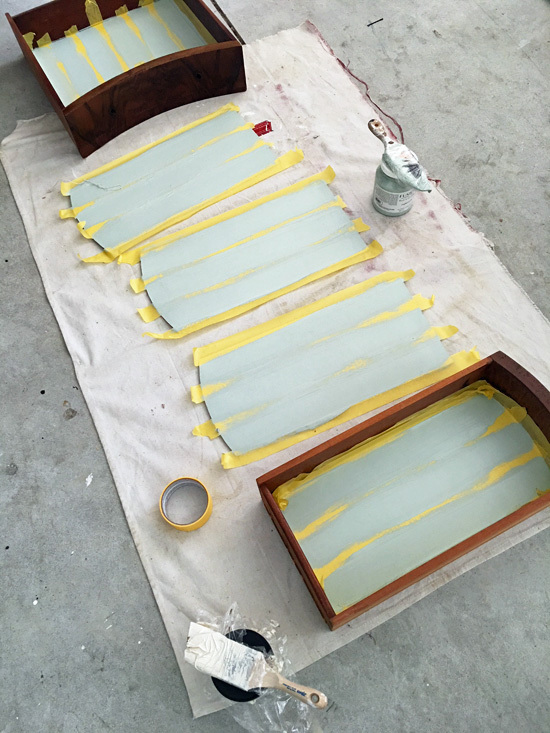 I didn’t see a link for: “I sealed the drawers with a matte spray sealer.” Can you tell possibly let me know what you used for that? Thanks again, and really appreciate the step by step description with links and your thoughts about why you did or didn’t take certain steps! Easy to follow and helps us to really appreciate all of your hard work! Great score. Turned out beautiful. Great make-over!!! Love it!! !….as always!!!! XXOO have a good weekend!!! It is Gorgeous!! You did an outstanding job bringing it back to life!! 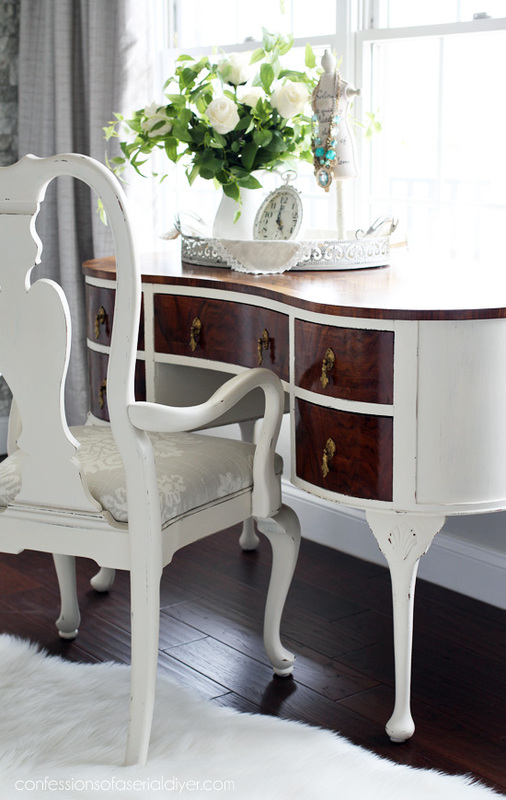 I noticed the chair has the same type of feet as the dresser – how lucky can you get! PERFECT! Last night, before bed, I was thinking, “I wonder if I could dry brush it with some gray or black? Wonder if Christy has done that?” LOL! Thank you, AGAIN! Really love the contrast on this piece, and the finish turned out nicely. I was hoping you’d change out the handles to make it a bit more contemporary, but it looks fine just the same. It could probably work as a small desk, too. Great job! Christy, the After shot actually, not kidding, made me gasp! I absolutely love it!! The extra shine just compliments the grain so beautifully!! You have a great eye for a bargain and an even greater eye for the finishing!! Thank you for sharing this. Oh I LOVE this one!!! The 2 toned wood is just gorgeous! That dark wood is beautiful with the white! Great idea. The inside of the drawers is like a little surprise too! pinned this:) Oh and I forgot to tell you…. after you suggested I get that rotary cutting mat for the fabric for the inside of drawers….WOW I use that tool so much!! Not only for fabric but also when I am designing patterns and I need exact measurements for lots of things. I want to give a shout out to everyone reading my comment if they don’t have one, GET ONE….and go through Christy! 🙂 Thank you so much Christy! I just thought it was for quilting and since I wasn’t a quilter I would never have bought myself one if you hadn’t said something- Not only is it amazing with fabric it works great for many crafts! Sorry, I know you painted these drawer liners but it just reminded me of the rotary cutter ..hehe…Just wanted to thank you! I love it!! I’m a bit of a wood purist, but I think you made the right decision in painting over some of it… if it can’t be saved, well, that’s what paint is for, right?? The end result is just perfect! So glad you were able to salvage most of the wood. 😀 The shellac looks better imo… adds a real classic shine to it, makes the wood look like it got a fresh coat of stain, too. Not sure what those squares are from, but I bet you’re right, something to do with the veneer. 🙂 The pulls look much improved! And the stripes are darling… someone is going to be very happy with this piece! amazing. 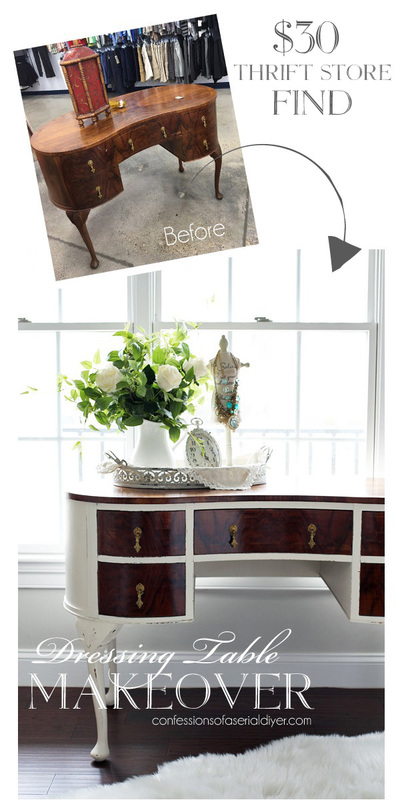 gorgeous find and fab makeover. two tone has me all in love! 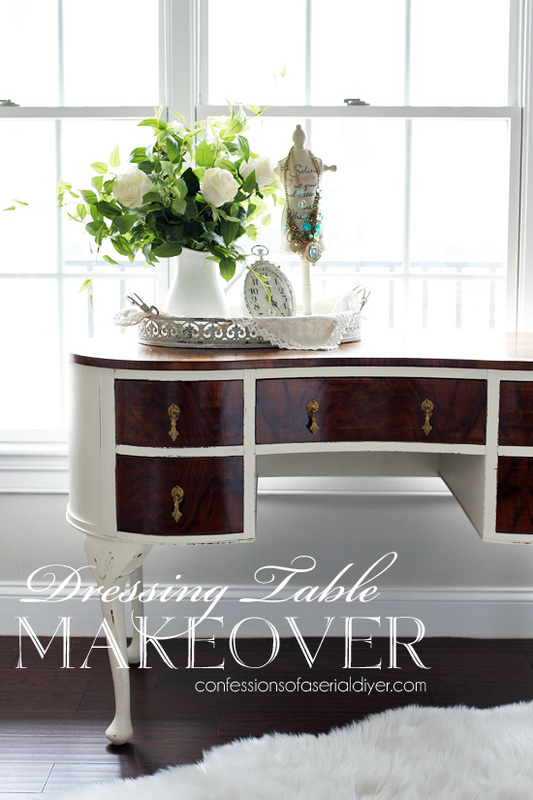 I think you did a beautiful job restoring/reclaiming the dressing table. I’m so glad you preserved some of the gorgeous wood. 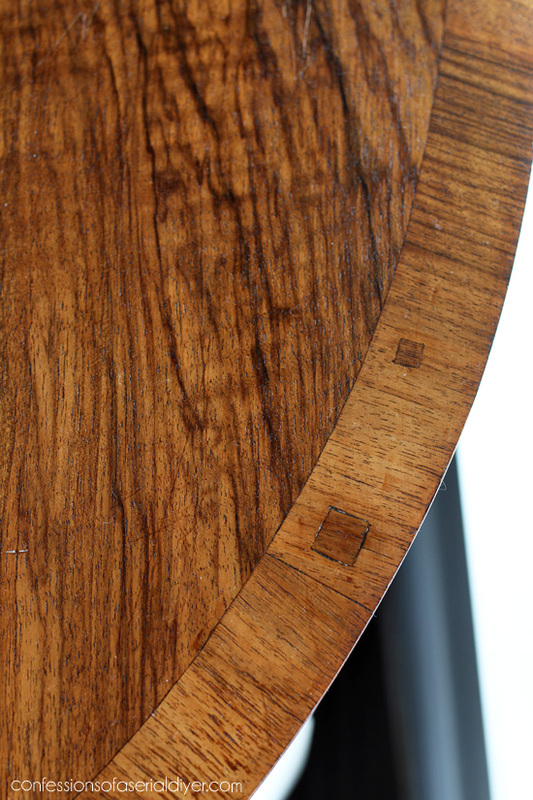 The top of the table is really amazing–the varied grain of all the pieces is beautiful. And I think the chair was meant to go with the dressing table. Good job, Christy! I think those square things might be wooden pegs which are structural. I have seen those on other old pieces, but I am not an expert by any means. I do like the burl wood look, and I am not sure I would have painted it, but the repairs you did to the wood parts look great. 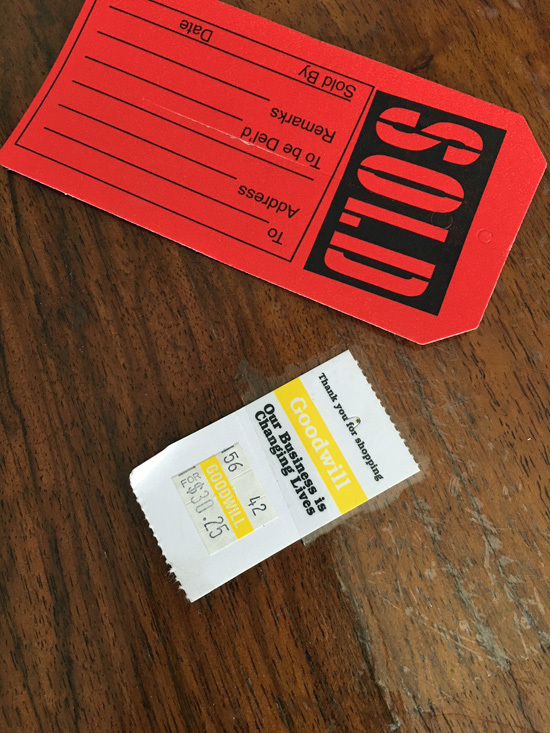 I am sure you will sell it very quickly! Beautiful, Christie. Great job, Wish it were mine. Wow, wow!! I’ve seen and done a lot of transformations, but this one takes a prize!!!! What a beautiful job you’ve done!! Thank you for sharing your gift and giving this old gal inspiration!! Beautiful! I just re-did a similar piece made by Dixie that is red mahogany. I think mine is pretty, but the details in yours makes yours even more special. 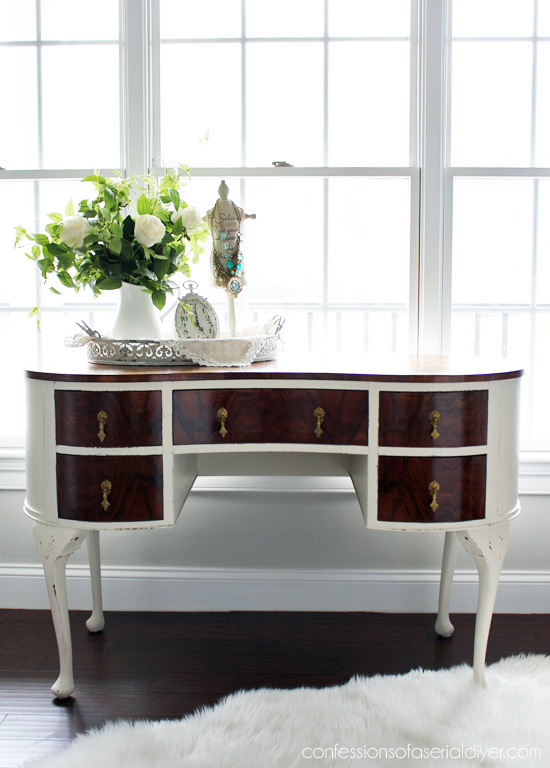 I actually spent a couple of hours on the internet trying to find out what piece I had….was it a vanity, desk, sideboard, etc.? and I finally determined it was called a writing desk. Just LOVE looking at your site Christy! You always have something lovely and inspiring for us. This piece turned out beautifully, and it’s even better because you left some of the “character” to the aged piece. Good score, great job! This piece is Gorgeous with a capital G!!! You are a professional! What a score of a find, so classic. 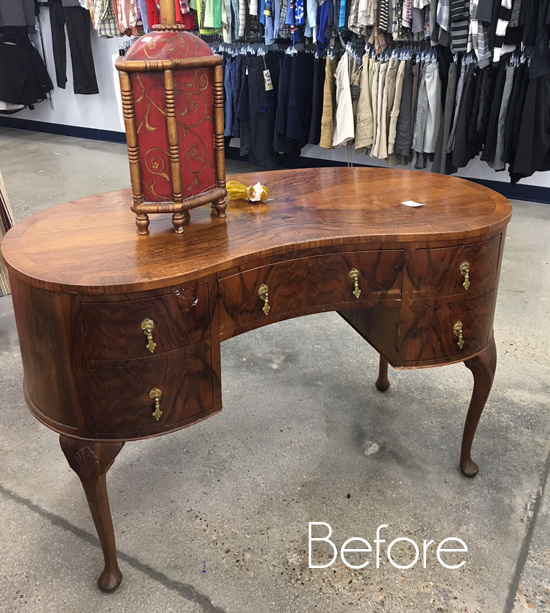 Oh goodness, a beautiful job you did on this makeover Christy, I love that you kept some of the original graining it’s just gorgeous! Hello! When I first saw the picture of before, I thought – oh no – don’t tell me she painted that beautiful veneer. The results are stunning! And I’m very impressed with what you did on the top using the clear shellac. I’ll have to try some of that myself. It’s beautiful! I do hope you’re planning on keeping it! What a great find and it’s absolutely gorgeous now! THIS may very well be one of my all time favorite pieces you have done! Just phenomenal!